Zombie-based learning teaches geography skills against the backdrop of a zombie apocalypse. Of course, the other students dismiss it, all except for one. He’s intrigued enough to dig a little deeper. 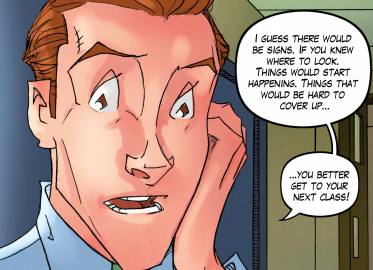 The student and Mr. Hunter begin plotting reported attacks on a map, and trying to discern a pattern in the outbreak’s spread. “They’re getting closer to us,” the student concludes. It may be too late. The zombie apocalypse is upon them, and only one thing can save them: geography. David Hunter developed zombie-based learning after just one year of teaching. This story is the brainchild of the real Mr. Hunter — David Hunter, a mild-mannered humanities teacher at Bellevue Big Picture School. Students at this alternative public middle school read the story not in a textbook, but a comic book (here's the free preview version). It forms the backdrop for an exploration of geography that Hunter hopes goes deeper than the stereotype of simply memorizing state capitals. The whole curriculum is based on more than 70 learning standards adopted by the state and by academic societies. The lesson plans fill a thick teacher’s guide and include worksheets, discussion questions and 10 full student projects. Students must consider how to duck the undead invasion, secure their supplies and, eventually, rebuild society. “Students have to create a project that outlines where they would choose to settle based on the physical characteristics, like the landforms and the climate,” Hunter says. Hunter got the idea when he heard another teacher lament about students who, instead of focusing on the lesson, only wanted to talk about zombies. He decided to try and create a curriculum that integrates zombies into the core concepts of geography. He launched a campaign on the fundraising website Kickstarter, hoping to raise $5,000 to develop the materials. He wound up with nearly $12,000. Zombies are all the rage these days, especially among seventh graders. Isabella Burckhardt and Jackson Hale were among Hunter’s guinea pigs. Burckhardt says prior to zombie-based learning, she had no interest in geography. 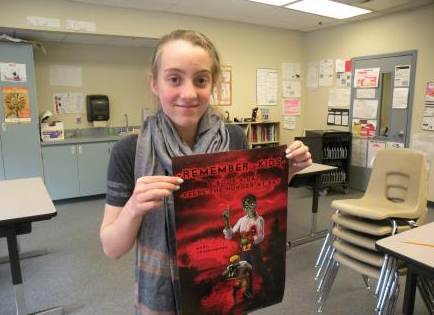 Student Isabella Burckhardt shows off a zombie-based learning poster. “It just didn’t sound fun. And memorizing stuff didn’t sound interesting, and I thought I wouldn’t even need to know that stuff. But ZBL, it’s like, oh, it sounds so much more fun now,” she says. For their part, the students don’t think the non-traditional approach sacrifices any rigor. They talk about the experience of plotting zombie attack data on maps, defining different regions and planning ways to get resources — all bread-and-butter geography skills. “I’ve always thought when you’re doing something you enjoy, you’ll remember it a lot better,” says Hale. 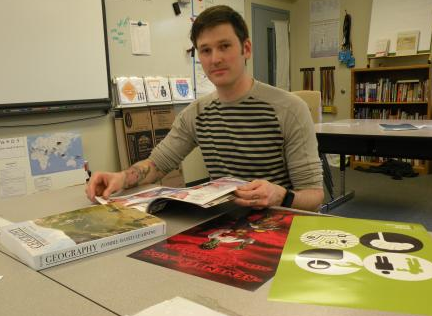 The students say the unconventional curriculum is in keeping with their teacher's personality. “He is definitely quite the character,” says Hale. 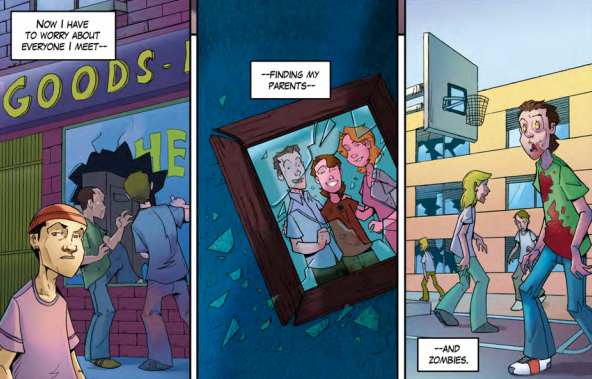 An excerpt from the first issue of David Hunter's zombie-based learning tool is seen. “He’s a really fun, creative guy. He’s into all different sorts of things like ballet and then parkour, and zombies and tattoos and school,” says Burckhardt. “There was a list of topics, and each student was assigned one randomly. And I got something I didn’t care about. And I saw a topic that I really cared about, and we couldn’t switch. Hunter went on to wash dishes and join the merchant marines before finding his way back to school. 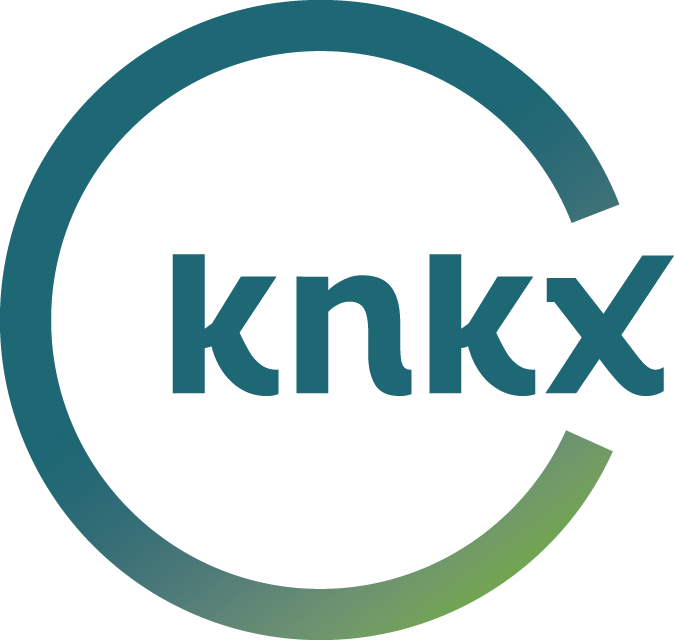 At Evergreen State College he rediscovered a love for learning, and a passion for motivating students. “Teachers are often teachers because they liked school, and it kind of perpetuates. So I do feel like I get to bring in the perspective of [some students]. I remember what it was like to not like school,” he says. Hunter says he’s lucky to have landed at Bellevue Big Picture School where principal Bethany Spinler gave him a long leash, though she did take some convincing. To Spinler, the real attraction is showing teachers how to take standards and materials that seem dry, and build something appealing to the students. Hunter’s own goals are only slightly less ambitious. Zombie-based learning is a down payment on that dream, and it’s already in dozens of classrooms around the world. Hunter is also in talks with a major textbook publisher. And with zombies now in classrooms, skateboard- and fashion design-based learning can't be far behind. So, when the zombie apocalypse comes, where will you flee? Should you hunker down on a remote island or blend into the urban landscape? Will the undead funnel onto bridges and viaducts? Do they like low ground or high ground? So many questions … now don’t you wish you’d paid more attention in geography class? Educators around the country are tapping into the interest in zombies in popular culture as a means to reach students. One such place using the teaching tool is the University of Idaho. Last week on the UI's Moscow campus there was a public lecture called "Zombies and International Politics." It was delivered by Tufts University professor Dan Drezner, who says zombies work as a metaphor for current global concerns.